Many events, plaques and paintings have been opened and unveiled in honour of the Queen's Diamond Jubilee year of 2012. St Paul's Church, built by the slave trade reformer William Wilberforce, has commissioned two new stained glass windows to mark the special celebratory year. The windows are by glass artist John Reyntiens who is best known for his design of the Queen's new Diamond Jubilee Window in Westminster Hall. This window is to celebrate both the Queen's Diamond Jubilee and the biblical Jubilee which was the culmination of the sabbatical years: a time of thanksgiving and an occasion for the exercise of faith that God would provide food and growth (Leviticus 25:8). The Water of Life, represented by the central blue lines, cascades from Heaven and feeds the growth of the Church's community and its continuing work. The donors will be represented in the grey parallel lines on either side of the water from Heaven - their names will be inscribed individually as a tribute to the community's involvement in raising funds or the Church. 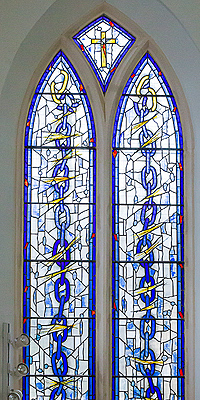 Click here to view a larger image of the window. In memory of William Wilberforce, this window features chains, linked and broken, symbolising slavery and freedom respectively. The red elements signify the pain and suffering endured while the golden colours, coming from Heaven, represent the Glory of God and Wilberforce's inspiration in his humanitarian mission. 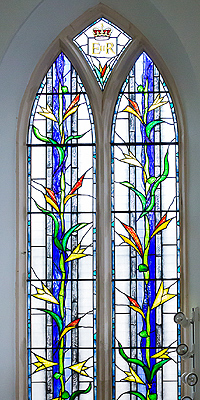 The window celebrates the unique contribution of the founder of St Paul's Church whilst recognising both the present community and the context for Wilberforce's leadership of the anti-slavery movement. You can now view online all the subscribers' panels on the Jubilee Window. Click here to view the subscribers' panels. In October 2014, a new stained glass window designed by John Reyntiens was installed in St Paul's Church. For information on the Middlesex Regiment Memorial Window, click here.